The Northern Powerhouse is an initiative that aims to improve the economy, travel, and general quality of life for the key cities in the North of the UK, including major cities like Liverpool and Manchester. 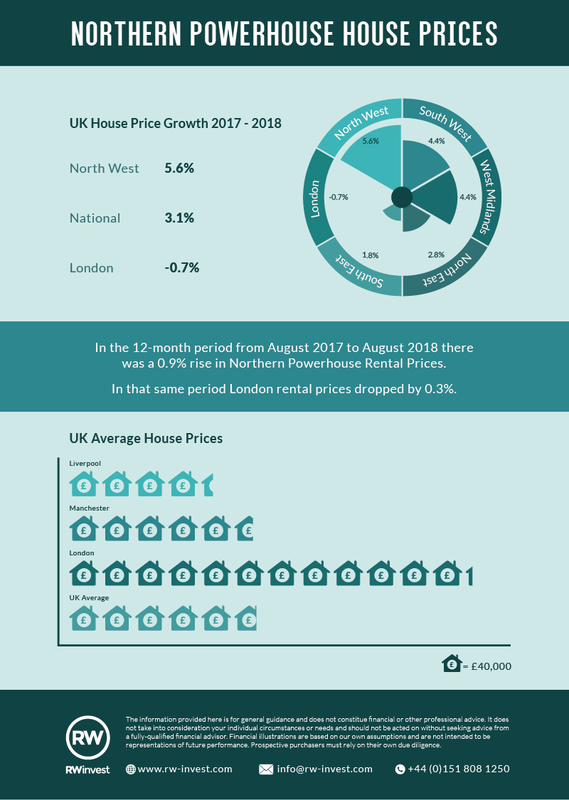 This infographic from property experts RW Invest outlines the increase of house prices within Northern Powerhouse cities, along with a rise in rental prices within these cities. On the contrary, London house prices haven’t experienced any growth yet remain higher than the UK average, with houses in Liverpool and Manchester costing more than half of London’s figure on average. Growing house prices in the Northern Powerhouse go to show that the economy in these cities is thriving, whilst a low average property price combined with high rental costs means impressive rental yields for property investors.